What a great looking group! Thanks Allison for the cool pic! Kate and Isabella discussed their VP positions. Barbara Kline volunteered herself and Sheila Gordon for the Nominating committee - Thanks! Please think about volunteering for these essential positions - need new people with new ideas . See the current group here. Allison S gave a BQE update. Workshops are open to BQE guild members only till Sept 1st at a discounted rate. Don't wait to signup - they are filling up fast. Also don't wait to enter your quilts in the show beginning Sept 1st. The first 200 quilts entered are guaranteed to be exhibited. All entered quilts will be judged but there may not be room for more than 200. The vendor spaces are filling up also. It's going to be a great show! Community Service : Please bring in any quilt tops or parts of the French braid pattern. Bring in everything you wish to donate. Get them done by October or November. Ryan’s Case for Smiles - Miami Chapter. Bring back in the finished cases washed and pressed in Ziploc bags. Join Susan at Miami Beach Regional Library for a fun evening making pillowcases on September 20th 3pm-7pm. Checkout Event Info for details. Linda reviewed the scary August BOM to be brought to the September meeting. Debby S showed the see thru zippy pouch for our September meeting swap. Make one to swap and one to donate for BQE sale. Come to Sew Day on Sept 1st to make them or see how it's done. See Lucky Project Bag Tutorial by May Chappell. Great small pieced blocks filled a whole table at the meeting - they look great! If you took some fabric last month and forgot them or didn't get a chance to make some you still have a little time to get them done and in the mail to Karla soon! Everything in her Charm Pack Challenge Bag! 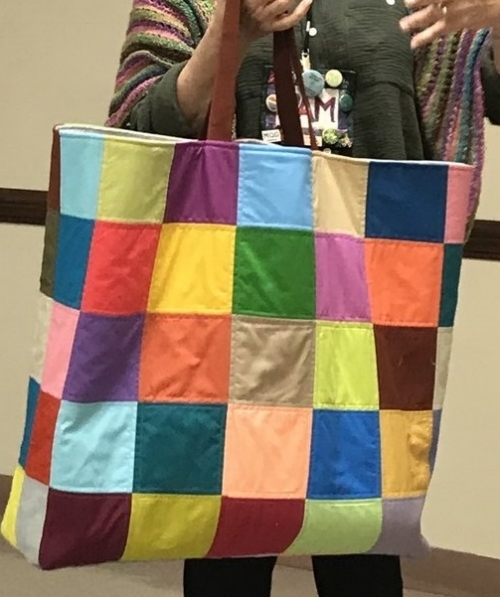 Following up on AJ's Color Theory Presentation last month and the announcement of a QuiltCon Two Color Challenge, Andrea and Charlotte presented information and inspiration for the SFMQG Challenge due at November meeting. Just in time to enter into QuiltCon and/or BQE and maybe a special SFMQG exhibit will be in the works soon. A separate blog post with Andrea's presentation and signup will be available soon. A QuiltCon and Michael Miller Fabric Challenge. 17 of the members signed up to get these fabric packages and Kate handed them out at the meeting. If you signed up and didn't get to attend the meeting contact Kate for yours. Make sure you bring your completed project for Show & Tell and/or post to Facebook members group.